Too funny; had a similar conversation on our way back from Moab this year. Colorado is a great location. Great wheeling and scenery in Colorado PLUS it's close to Moab and California isn't that far either. KOH and the Rubicon and Fordyce. All the awesome wheeling is out West. Well, dropped the rear driveshaft off to get shortened. Got the tcase installed, new muffler, rokmen skid installed and lined with plastic on the bottom. Exhaust tone is nice not loud but a good rumbly tone. Gears and lockers showed up today. Should see my compressor and winch tomorrow. Hoping to get everything done by next weekend. This. Thing is looking great man. And fast at that. Except we forgot I needed the ring gear spacers until I went to install the ring gear on the locker this morning he's sending them out at no charge hoping I see them tomorrow. I was looking all over for d44 ring gear spacers a while back, never found any. Was thinking of having them made. Wanted to go 5.89 on rubi lockers. they just came out with thick 5.38s, so I settled for those. My ring gear bolts are 3/8,yhe locker is drilled for 7/16. So the spacers take up the extra bore space centering the bolts in the holes. Ahh. The bolt spacers. I get it now. I thought mabey u were gonna run like 4.88s, on a 3.73 carrier or something odd like that. I was surprised the 5.38s I just got were dual drilled for either bolt size. 5.13s are availabel for the tj xj dana 30s now too. I wouldn't a little beefier pinion, and this winter I am doing a 5.3 swap. Biggest tire I plan to eventually run is 37s. But the 35s for awhile. I think the 4.88s will serve me well. My next big purchase will be rcvs. For your 14b front right? 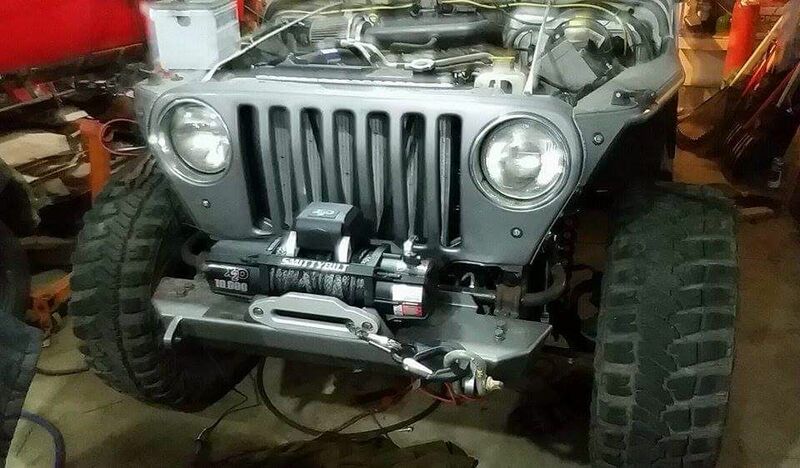 and this winter I am doing a 5.3 swap. .
New winch installed and wired up. Got my 12 volt guy dash winch controller wired in as well. Also I installed a new fuse box under the dash for the new electronics. Where are the bolts that hold the bumper from the top and bottom at the front of the frame? All I see are the 4 bumper bolts in back. There isn't any at the front? 4 top, 4 bottom. Front of frame isn't capped, it's open. There should be 4 spots at the front of the frame about 3-4 inches in front of the rear ones where the front bumper bolts are. Top and bottom. Haven't seen 4 bottom bolts before. Done many of those. Maybe the LJ's are different.